Christian Lee, a student at New Horizons Academy at Sara’s Garden in Wauseon tries out one of four Rifton Adaptive Tricycles donated by the Toledo Community Foundation and the Toledo Mud Hens Baseball Club’s Helping Hens Fund for special needs students. The Toledo Community Foundation (TCF) and the Toledo Mud Hens Baseball Club’s Helping Hens Fund has awarded Sara’s Garden in Wauseon $5,944 for four Rifton Adaptive Tricycles for its special needs students and summer campers. 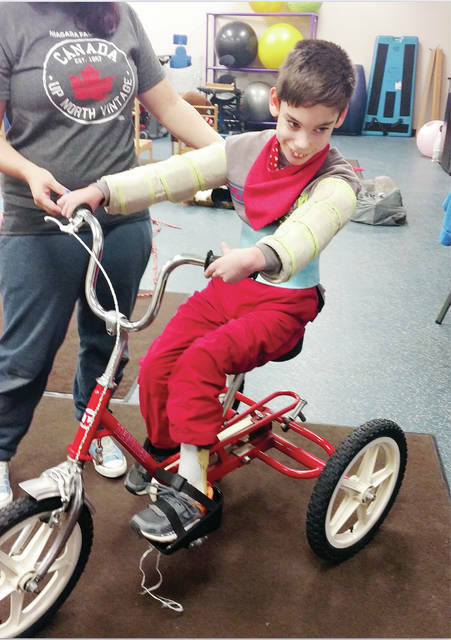 Rychener said in addition to the youthful exuberance that bike riding brings, the adaptive tricycles bring many therapeutic benefits to children, who spend a great deal of their time sitting or using a cane or walker. The benefits include strengthening lower extremities, patterning leg motions, developing balancing skills, using visual and spatial perception for steering, and interacting with peers and classmates. The Toledo Community Foundation’s Helping Hens Fund promotes the overall fitness and wellness of children in kindergarten through 12th grade in the Greater Toledo Metropolitan Area by sponsoring exercise, sports and/or physical recreation programming. The Toledo Community Foundation, Inc. is a public charitable organization created by citizens to enrich the quality of life for individuals and families in the area. TCF has more than 800 funds with assets of approximately $291 million. https://www.fcnews.org/wp-content/uploads/sites/45/2018/07/web1_sara-s-garden.jpgChristian Lee, a student at New Horizons Academy at Sara’s Garden in Wauseon tries out one of four Rifton Adaptive Tricycles donated by the Toledo Community Foundation and the Toledo Mud Hens Baseball Club’s Helping Hens Fund for special needs students.